Valve launched the Beta for its SteamVR Home, and we're not sure we want to leave it anymore. Why? Well, can you customize the environment in your living room depending on your mood that day? Does your living room have integrated social features and a Steam interface? We'll take a wild guess and say "No". Environments can now be higher resolution and support animation, sound, games, and interactivity. Players can teleport around and explore any of the hundreds of environments created by the community. In addition, players can customize and save their environment with props and drawings, then set it as their default home space. SteamVR Home will try to bridge the gap between the current desktop steam interface while integrating meaningful and functional social interactions with your friends whilst in VR. If you're familiar with Valve's work on Destinations, you'll love to know that Valve took the its core functionality, reworked it, and renamed it SteamVR Home (Beta). With that said, the Destinations app will no longer be updated. 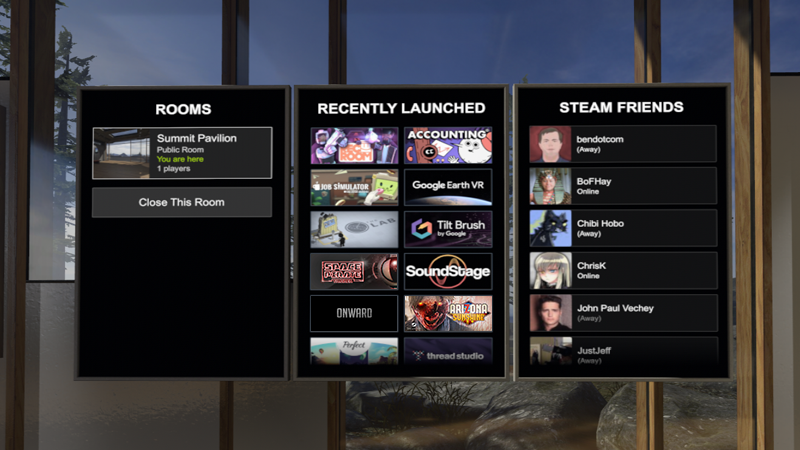 SteamVR Home will try to connect the current desktop Steam interface while integrating social features to help you connect with friends and other players via voice chat, interacting with tools and props, and exploring different SteamVR environments. So, would you enjoy living in a VR home? Tells us here or on our Facebook page!